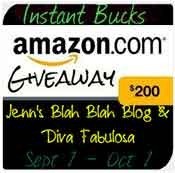 Instant Bucks is sponsoring this event, which will offer one reader (one winner chosen from many blogs) a $200 Amazon Gift Card! Doesn't that sound great!? The event will be hosted by Jenn’s Blah Blah Blog and Diva Fabulosa! If you have not signed up with Instant Bucks, do it now! They are new, but very similar to Superpoints. BLOGGERS WANTED: Join us and offer your readers this fabulous prize! Event will run from Sept. 1, 2012 until Oct 1, 2012! Bloggers will get a free Facebook link, and a chance for one of their readers to be the winner! Click here to learn more about this Amazon Giveaway.